Back to familiar ground, with another recipe round-up. Today's is from 1000 Vegan Recipes by Robin Robertson, which I have already made several round-up posts about. Today's round up will look at some combinations of recipes I have made from the book and served together. I thought I would keep up my system I started during Vegan MoFo of writing down my ratings for each recipe. Sesame Spinach Noodle Pie: Linguine and fresh baby spinach, baked together in a pie plate with a creamy sauce made from tahini, garlic, miso and lemon. 4 stars. Ginger-Tamari Braised Eggplant: This was a nice, salty and gingery dish - the flavours came through really well. It is good, though my money is still with the amazingness of the Mahogany Eggplant in Robin's Vegan Planet. 4 stars. 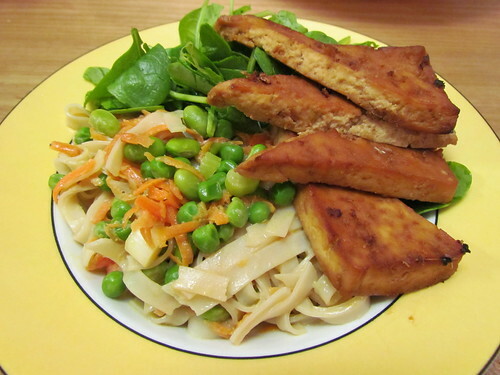 Soy-Glazed Tofu: I think have written several odes to this tasty, quick tofu delight. 5 stars. All up: This made for a really nice dinner. 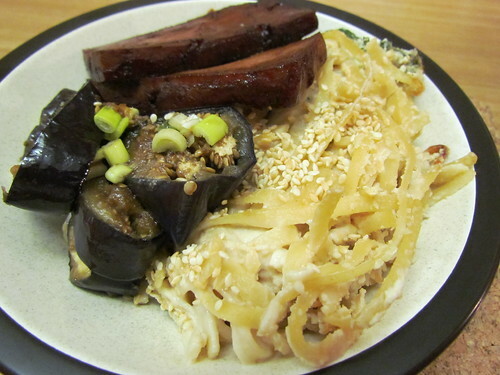 The creaminess of the noodle pie went nicely with the saltier flavours of the eggplant and tofu. Some steamed broccoli would go great as well! Springtime Rice Noodles with Coconut Creme: This is a creamy, Asian twist on pasta primavera. Vegetables included edamame, green onion, carrots and peas, though you could really add anything you wanted. I only used 200g of dry rice noodles (the recipe calls for 12oz - approx 330g) and I had enough to serve 5-6 people. 4 stars. 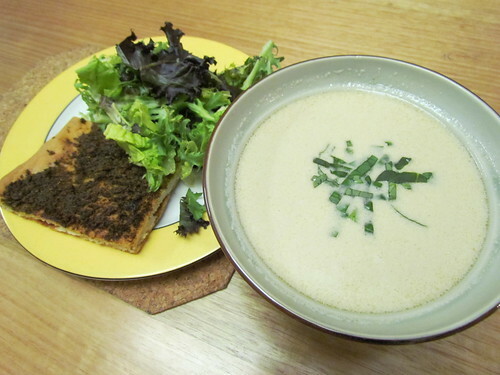 Ginger-Soy Marinade (on Tofu): This recipe is in the Marinades section. It is amazing - gingery, salty and sweet. I baked the tofu in the marinade, and one recipe was perfect for my 500g block of tofu. This is awesome. 5 stars. All up: My brother's friend ended up staying for dinner this night, so thankfully there was enough to feed an extra mouth, and it was a huge hit. I also served some baby spinach leaves on the side. Portobello Po-Boys: Mushrooms cooked in a Cajun seasoning with all the fixings makes for a great sandwich. 4 stars. Pumpkin Soup with Chipotle Puree: I used fresh pumpkin puree here, and I admit I used butternut as it was just easier. It was a great flavour, chipotle makes everything awesome. 4 stars. Butterhead lettuce and Walnut Salad with Raspberry-Walnut Vinaigrette: All hail the salad spinner for giving lovely dry, soft lettuce leaves. This is a really nice salad - it's fancy! The dressing is delicious. I am not the hugest fan of walnuts, but I stuck with them for this recipe and the dressing makes them amazing! 5 stars. 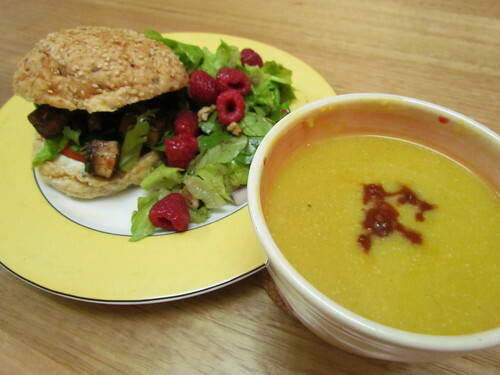 All up: The sandwich and the soup were made for each other. The salad was amazing, though maybe a bit fancy for the rest of the meal, but I liked how it went together anyway. Thai-Inspired Coconut Soup: This soup is very rich from all the coconut milk. The book suggests serving it with the Thai-phoon Stir-Fry, but that also has coconut milk so I think would be too much for me. Thai Pesto Foccacia (from Vegan Planet): Robin's recipe for Thai Pesto is delicious, so I had high hopes for it on foccacia. Unfortunately, a friend showed up while it was baking to give me her house keys and I overcooked it! So some parts of the pesto were burnt, others weren't and the foccacia was way crispy. Woe. All up: I haven't given these ratings. I can't blame to foccacia for my distraction, and knowing how good the pesto is, it would have been great had I done it properly! Also, unbeknownst to me at the time of eating this I was brewing a tummy bug, and by that night was in a woeful state, so I can't fairly reflect on these recipes as they kind of remind me of that illness. Poor innocent bystander recipes! Seitan Piccata: I love piccata. Love it. The sauce is magical! This is a good piccata recipe. I skipped the step where you dredge the seitan slices in flour and just pan-fried them straight. 4 stars. Ted's Artichoke and Green Bean Bake: This recipe has a history - buy the book and read about it! 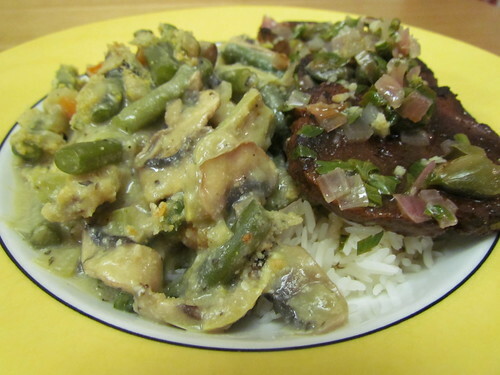 It was a really nice bake, artichokes, mushrooms, celery, onion, no capsicum for me, and a slightly creamy sauce. 4 stars. All up: These are a funny pairing of recipes. I just opened the book up at random when menu planning for this night and committed to whatever came up. They are both lovely, though perhaps not the most conventional to have together. I also served with some white rice. 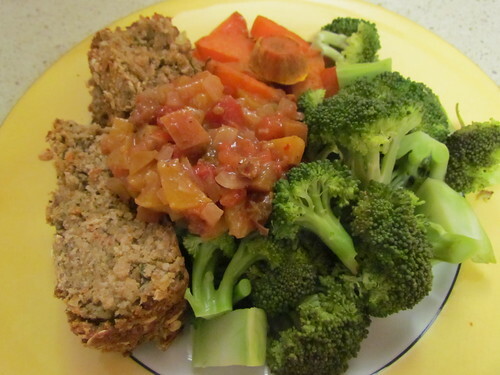 Chickpea and Vegetable Loaf: The ingredients for this were a bit too much for my 2L food processor - I need to upgrade! I found that I had to add a few splashes of soy milk to hold it together, or the mix was too dry. When it came out of the oven, the flavour was good but I found the texture a bit gummy. 3.5 stars. Spiced Tomato and Peach Relish: This is really good. Like, really good. Really, really, really good. You can just eat the leftovers on toast or on a spoon or mixed into things. Good. 5 stars. 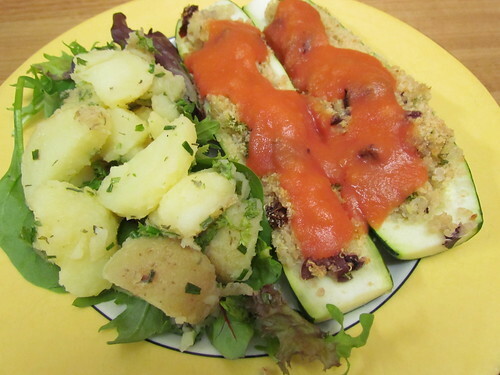 Quinoa-Stuffed Zucchini: I love stuffed zucchini! I think my medium zucchinis may have been smaller than Robin's, because I didn't even end up using half the quinoa stuffing mixture. This is OK though, because it is great on it's own. Have it on toast for breakfast. 4 stars. Fresh Tomato Sauce: This is a very easy sauce to make, and it is really smooth and nice. Definitely fresh. 4 stars. French-Style Potato Salad: I prefer potato salad with a vinaigrette rather than a creamy, mayo dressing. This was lovely, especially made with tarragon vinegar. I decreased the amount of oil in the dressing by using 1 part olive oil and 3 parts water. 4 stars. All up: A very delicious and summery dinner! Couscous Pilaf: This pilaf has the perfect couscous:vegetable ratio, and the vegetables are so lovely in it. 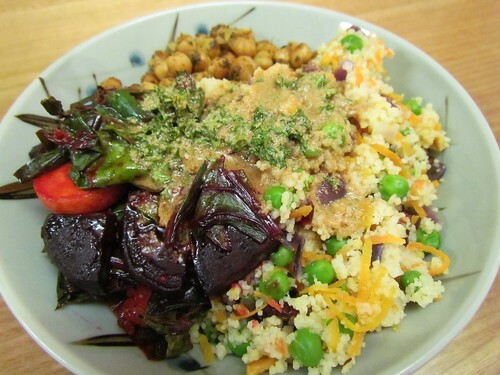 There is red onion, carrot and peas, plus some chopped dried apricots and dried cranberries. This would be perfect to take to a pot luck, or to make ahead for work lunches. 5 stars. Beets with Greens and Slivered Apricots: I hand't read this recipe properly, and when I came to make dinner I suddenly realised I was meant to have roasted the whole beetroot and the set aside to cool! Well, instead I sliced the raw beetroot as required by the recipe and I roasted at 200dC for 30 minutes and it was fine. Also, as it was pre-sliced, I could just plonk it straight into cooking without waiting for cooking. I found the apricots in this dish a bit too overpowering for me, I am funny about apricots in savoury dishes (I thought they were fine in the couscous above). But apricots aside, this was lovely. 4 stars. All up: A really nice and colourful plate, these went so well together! I also served some Moroccan chickpeas, which was just a tin of drained chickpeas mixed with some Moroccan spice paste and baked in the over for about 30 minutes at 180dC. 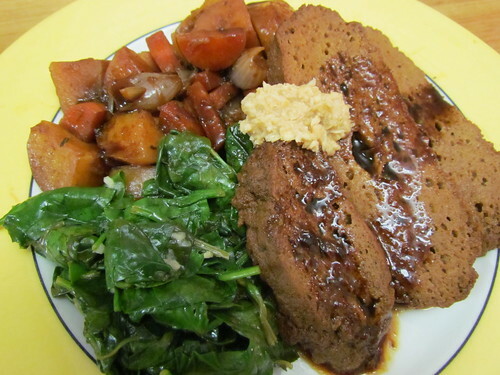 Seitan Pot Roast: I posted about this during MoFo, as an amazing recipe. Reduce the liquid afterwards for a great sauce. And definitely serve with horseradish. 5 stars. Baby Spinach with Lemon and Garlic: Be on the ball with this, because baby spinach turns from wilted to mush very quickly! It is a nice, lemony side dish. I left out the optional butter at the end, which would have added some extra richness. But I think it was just great without it. 4 stars. All up: A classic Sunday dinner. And I made it on a Sunday. I felt so nifty doing this! Eat up, kids! A bonus sweet treat to finish. After making the roast dinner, above, it seemed remiss of me not to provide dessert. So I quickly put together this rich, thick, fudgy chocolate sauce. So yummy. 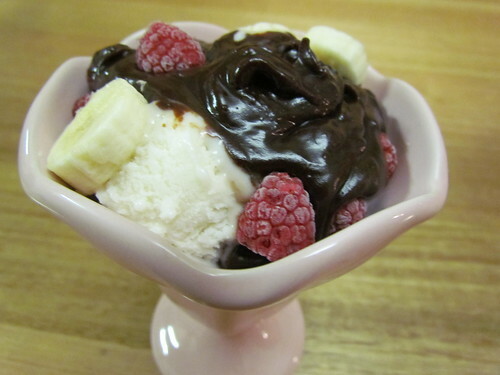 I made a sundae with vanilla ice cream, bananas and raspberries. 4 stars. For those who don't follow me on Twitter, check out these cuties. Everyone should have a chance to look at this adorable trio. 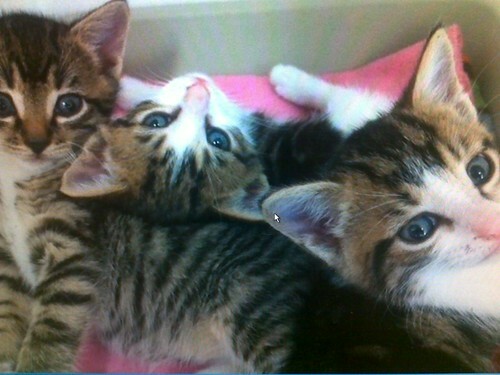 Rosie, Lizzy, and Nate are three kittens that will soon be available for adoption. Their mother had them in a garden bed outside an office building, so they came to live with us (sadly the mother was not able to be caught). They will be ready for adoption in a few weeks! Nate already has a hold on him. Live near Brisbane? Call 3367 0011 and speak to the clinic for more details!